Welcome to my wavetable resources site. You will find free wavetables for DUNE2 and 3, as well as Serum, Hive, and compatible formats. Note that since the introduction of DUNE3, no more DUNE2 versions will be made due to their larger file size. Now available in Waldorf Blofeld and IL Harmor formats. Please contact me if you would like to see other formats. I have released my first and only commercial wavetable package. Formats are for DUNE2/3, Serum and compatible wavetable synthesizers. Blofeld compatible tables to arrive shortly. Purchase buys you lifetime updates, i.e., every single new wavetable I make for these formats will be yours too without further purchase! The full package contains >2500 wavetables for DUNE(2+3)/SERUM/ICARUS/FALCON and compatibles as well as >2000 for BLOFELD and costs only £10 (with lifetime updates). Follow the links below for a sampler pack of 32 wavetables for DUNE2, Blofeld, and Serum compatible synths. 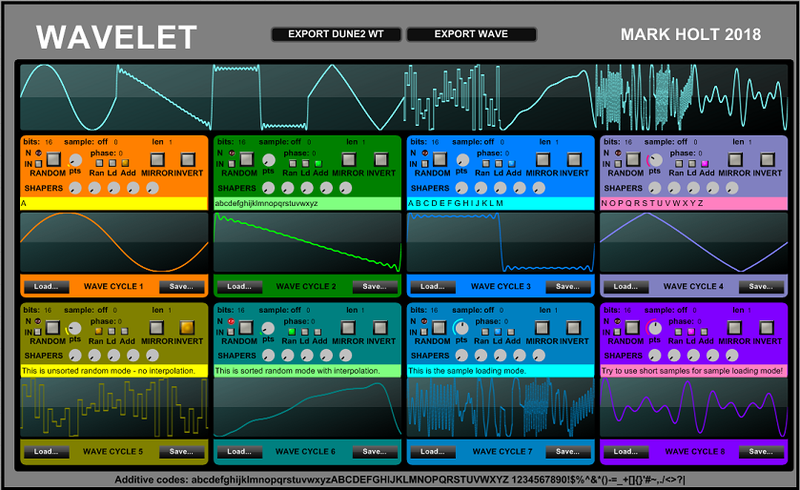 See futher down the page for DUNE2 wavetables that can be used for waveshaping and custom LFOs. This one is simple, but very special. It's your gateway to waveshaping with DUNE2, e.g., phase modulation and distortion. Note that I have two voices here panned hard left and right with a pitch difference for Osc2 of 12 semitones. Try changing the modulation amounts using velocity, aftertouch, envelopes, LFOs, MSEGs, etc., and even Osc3 for something more extreme. Try using more than one voice to do parallel modulations, e.g., 2 voices for 4-op, 3 voices for 6-op, all the way up to 8 voices for 16-op FM! By combining this approach with DUNE2's native FM, plus Osc3 and some minor compromises, it's possible to emulate all 32 algorithms of the Yamaha DX7! Using all 8 voices as parallel FM modules, one could devise a 56-op FM patch, although you might want to upgrade your computer first! Here's an audio example of a wavetable acting as a modulator of a sine carrier. The wavetable used is MH Feedback FM 1. Velocity modulates wavetable position. 0Hz wavetables - waveshaping and custom LFOs!! Some free 0 Hz/waveshaping/LFO wavetables are available in the link below along with a demo patch. What you'll see is that each slot of the wavetable is a DC offset that follows a set path when modulated. In DUNE2, wavetable position can be modulated by many things, in this case the most sensible is another oscillator, LFO or MSEG. When modulated in this way, it can be used to modulate pretty much anything else. As these are DC offsets the basal frequency is 0Hz. However, once modulated, they take on the frequency of the modulator. There are twelve such wavetables, plus another wavetable required for the patch. The free wavetables are derived from a current total of 128 transfer function wavetables, which are available as part of the lifetime updates deal (£10). There is a PDF file that shows all of the 128 transfer functions in the download below. More wavetables and DUNE2 patches will appear here in the near future as well as further information, tips, tricks and audio examples. If you would like to see these wavetables available for other purposes then please put a request in to the comments section below. Purchase DUNE2 and Serum-compatible wavetables with free lifetime updates for £10 using the button below.